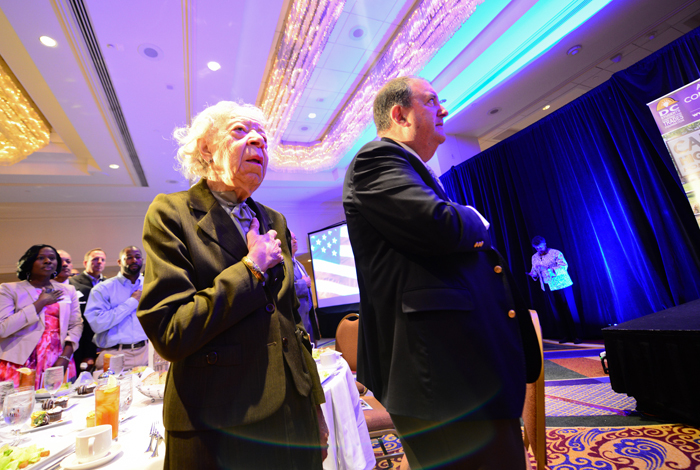 'I PLEDGE ALLEGIANCE' Ida Margaret White (left) stands strong in her American pride at the 2013 Meet the Future Luncheon. Ida Margaret White was born on Aug. 1, 1924 and died on March 19, 2016, leaving this world and our organization, the JOBS Coalition, much richer because of her presence and wisdom. Margaret, as she preferred to be called, was an active board member of both the JOBS Coalition and the DC Students Construction Trades Foundation for over 12 years. To each organization, she brought a wealth of knowledge on housing issues gleaned from her longstanding and varied career at the Department of Housing and Urban Development. That experience – coupled with her unwavering commitment to help the underserved – made her a strong advocate for the goals of our organizations, which were to find sustainable employment for the unemployed and build bright futures for young people. Margaret rarely missed a meeting or event. Although the only female member serving on both boards, she was never afraid to express or offer constructive criticism to fellow board members if she felt it was warranted. by the DC Students Construction Trades Foundation. During the event, one or more students enrolled in the Academy of Con- struction and Design is awarded a Norman Dreyfuss scholarship. That year’s winner failed to thank Mr. Dreyfuss for establishing the award, and the panel for selecting him as the winner. Margaret publicly admonished the student for not showing the proper appreciation. Needless to say, that was the last time that omission occurred. She was smart, tough and feisty, but also funny – and a stylish dresser. I never saw her in the same outfit twice, and she believed in accessorizing and wearing the latest suits and dresses. These attributes just touch on who she was as a person. We were lucky to have her in our lives. She was an outstanding example of “wearing out rather than rusting out,” as the saying goes. Margaret White, you will truly be missed. Carol Randolph, chief operations officer for the DC Students Construction Trades Foundation, is co-founder of the Academy of Construction and Design and an adviser to the JOBS Coalition.